We all know that TV news loves covering after Thanksgiving shopping — so you would think someone who works at a TV station would remember that Black Friday is, well, on a Friday (and that Thanksgiving is always on Thursday). 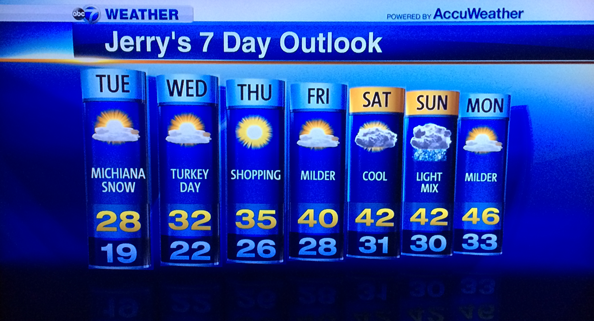 Jerry Taft, a meteorologist at ABC O&O WLS-TV in Chicago, rearranged the week a bit in his 5 p.m. weather segment Tuesday evening. It appears the error stems from the seven day board having its day labels at the top of each column mixed up — in other words what’s labeled “Tuesday” should actually be “Wednesday” (since you wouldn’t be giving the current day’s forecast), the column labeled “Wednesday” should be “Thursday” and so on down the line. Taft realized something wasn’t making sense and an awkward moment of silence followed before he realized his mistake. The graphics shown are from the station’s new graphics package, which was introduced about a month ago.